All you need to know about Blake Lively's new website "Preserve"
It seems like months now since we first heard the news that Blake Lively was launching a Goop-like site called Preserve. We had been awaiting the big launch day, July 23rd, but it seems Lively & Co. chose to throw caution to the wind and launch two days early. Seems that Blake Lively's Preserve is all about "preserving America." Or, in Blake's words from the Editor's Letter: "As for how we operate, we haven't looked at Preserve as a new website, but rather as a new street. A sort of greatest hits of "Main, Street, USA." Blake Lively is not the main contributor to the site, as expected. There is a whole team of "tight knit" individuals working to make this a success. The site seems to cover every facet of life - also known as being an all-in-one blog. Preserve will be covering food, fashion, DIY, health, relationships and more. It basically sounds like it will cover everything from start to finish in life. A lofty task. 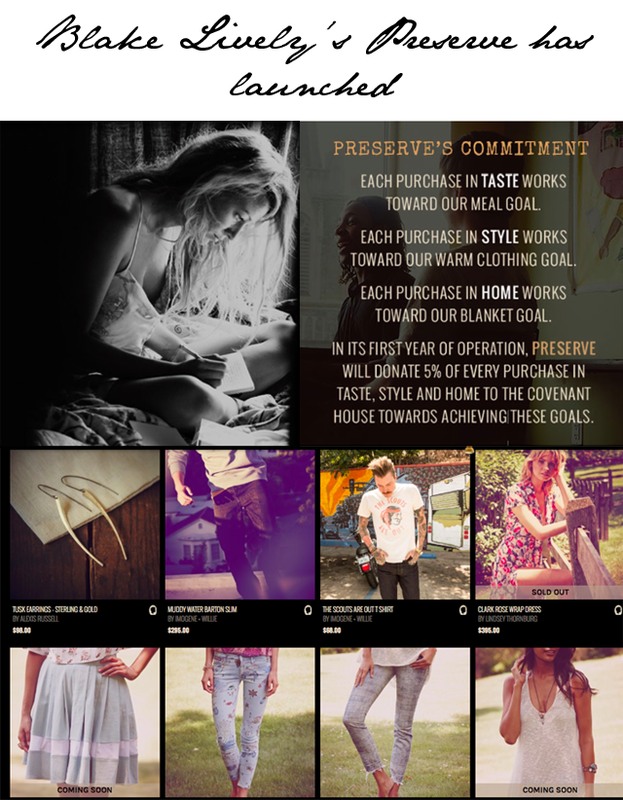 The intro to the site fully acknowledges that Preserve is a "for-profit" business and they acknowledge that there will be items on the site that many will find "outlandish." However, Preserve follow that by stating that they are looking to provide meals for 5,000 children, blankets for 2,000 and hoodies for 2,700 within the US. Then we get to the actual charity numbers. Only 5% of proceeds will go to the charities named in the project. Disappointing. That's less than Kim Kardashian gives to charity from her eBay sales. Hopefully the number will change as the site grows? Let's look at it this way, it's a start. When it comes to shopping, it seems Preserve is following in Blake's stylish ways. It's a little bit country, a little bit vintage and a tad Gossip Girl under a sepia filter. It's also just as expensive as was warned. Yet, that hasn't kept a few items from already selling out. That was fast! There's a real celebration of America's artists to be found in the Artisans section and the edit, thus far, is pretty impressive. Worth checking out. That's the story so far. After a quick perusal I'd say it's an interesting beginning with good intentions. From a personal perspective, I'm pleased to see a site celebrating my home country and the amazing talents that are found within these fifty states. It's surprising that it's taken this long to make it happen. This is a site telling a tale about America and turning around to try and heal it from within in addressing some serious problems we have with the youth in this country. So Blake Lively, Godspeed. Make it happen. Let's see what you can do. We'll be watching.